After combining other stitches with this stitch, this sampler was completed today. The other stitches were worked over this stitch [a long name] in these samples. First sample has buttonhole stitch variation and detached chains. The second sample has cretan stitch worked into it. the third sample has herringbone and quarter buttonhole wheels on it. A very lovely stitch to work. I am not getting many ideas because my husband needs to undergo another surgical procedure – Virectomy on 30th march. 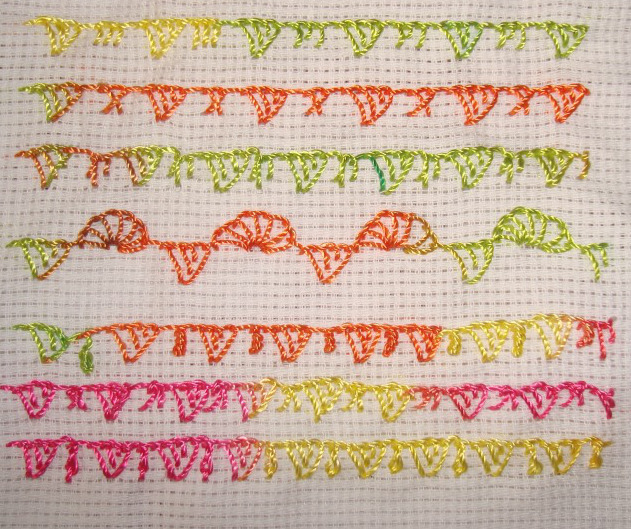 This stitch is similar to last week’s stitch, the working of which is on SharonB ‘s blog. I worked some samples today. 1.The first row is the stitch example given by SharonB. Keeping with basic idea of this stitch, the second row is worked in two colours. The third row is worked with single cable chain stitch left without buttonhole stitches in between alternating buttonholed cable chain stitches [Phew..] . Another variation of this stitch worked with two colours in the fourth row. 2.Long and short cable chain stitches are alternated in the first row. Alternate cable chain stitches are fully covered with buttonhole stitches in the second row. Zigzag cable chain stitches with alternating buttonhole stitches forms the third sample. The working of this week’s beaded triangular buttonhole stitch on TAST 2014 challenge is on SharonB ‘s blog. 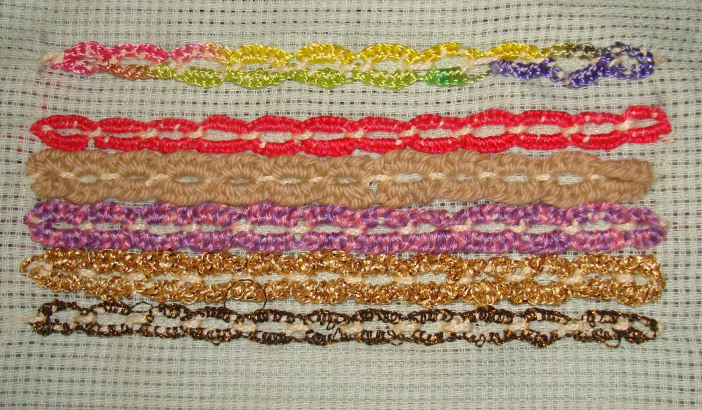 I worked this sampler with pearl beads and peach colour cotton skein. 1.Three pearl beads are added to the last side of the triangle in the first row. 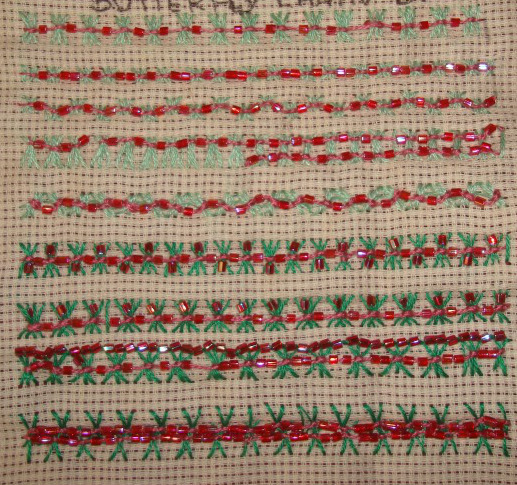 Beads are added on to each stitch in the second row. Three beads are added in between the triangles in the third row. I like this row. 2.Beads are added to the first stitch of the triangle in the first row. Beads are worked inside the triangle in the second row. 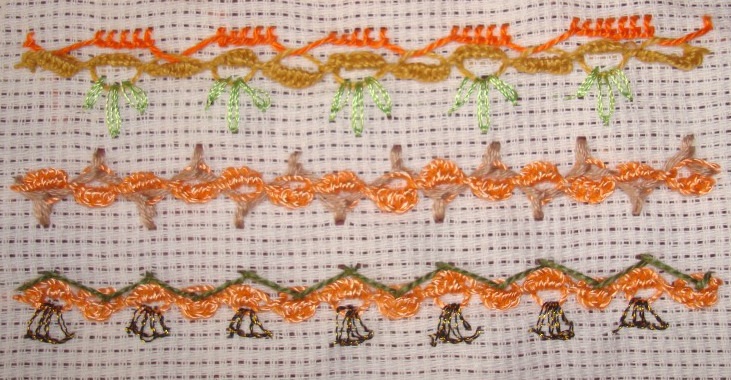 Two beads are added to the alternate inner stitches in the third row. 3. 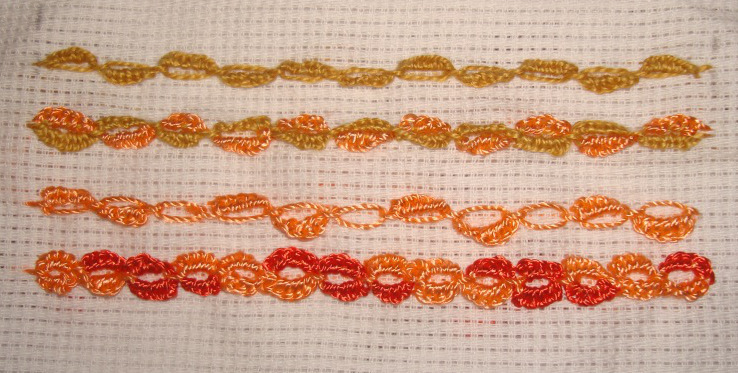 The stitch is combined with buttonhole stitch to which three beads are added. The bead is added to the first stitch of the triangle which is long, the finishing stitch which is short secures that bead in place in the second row. All three stitches of the triangle are beaded, a small stitch is used to tie the stitches together, to hold the beads in place in the last row.